CD reviews: "Hurry Home," "Live at Athenaeum Jazz" and "Minor Miracle"
These reviews first appeared in the Winter 2004 issue of Turbula. San Diego has long had a vibrant, active jazz scene  and if it's not on a level with, say, New York, Chicago or New Orleans, the fantastic weather and lively night life have attracted world-class players like Laurindo Almeida, Jeannie and Jimmy Cheatham, Charles McPherson, Mundell Lowe, Calvin Jackson and Jimmie Noone Jr., among the luminaries who have made San Diego their base. Barney Kessel and Chubby Jackson also both retired here, playing the occasional gigs around town before age robbed them of their chops (although Jackson played one last gig with his son, Duffy, at his old haunt, La Tapatia on Grand in Escondido, shortly before he passed in 2003). Even the great jazz writer Stanley Dance retired to San Diego, selling off much of his magnificent collection of jazz records to finance the move, and soon becoming a regular with wife Helen at the local jazz spots. But San Diego has also produced its own homegrown talent, both native-born and those who created their legacy after moving here. And of our local jazzsters, three have new albums out  recordings that show that San Diego is just as capable of producing great music as any of the above burgs. Hall Sprague is in a sense the patriarch of San Diego's jazz scene, for his sons Peter and Tripp are among the longest-serving and best-known of the area's top-rank jazz musicians. 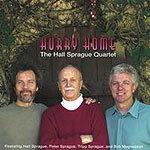 And while Hall has played percussion with both his sons for many years, "Hurry Home" is his debut as leader. Given that Hall Sprague is not a dedicated, professional musician, but someone who came to music later in life through his sons, this is a remarkably polished, lively set. That's due, no doubt, to the caliber of talent surrounding him here  Peter on guitar, Tripp on reeds and percussion, and San Diego native Bob Magnusson on bass. But here's the thing: Mag played bass for Sarah Vaughan and Buddy Rich before returning to San Diego, Peter is an in-demand session player in L.A., and Tripp can hold his own with either. So you have three of the best jazz players anywhere  providing a supportive environment for Hall to lay down the rhythm. And one gets the feeling that what Hall has really done here is create an environment for these young men in his life (Mag being a friend of the family and collaborator of Peter's going back to the 1970s) to create some magic  choosing the songs, overseeing the sessions, making sure everyone had fun. Because that's what really comes through on these tracks, the sound of four friends having the time of their lives. Running through standards like "My Funny Valentine" (stunningly gorgeous acoustic intro by Peter followed by heartbreakingly beautiful solo by Tripp on tenor sax), "Here's That Rainy Day," "Just You, Just Me," "All or Nothing at All" (the uncredited 11th track) and "A Fine Romance." Playing new songs by Hall and Peter. Romping through Sonny Rollins' "Solid." It's the sound of love  of life and of the music. Mike Wofford and Holly Hofmannn are, next to Jeannie and Jimmy Cheatham, San Diego's best-known and most talented jazz couple. Does any other town outside New York have two such couples so prominent and gifted? Wofford was long part of the best jazz rhythm section in Southern California  one of the best anywhere, in fact. Back when Elario's club was bringing some of the top jazz talent in the world to La Jolla Shores, Wofford held down the piano seat in the house band, along with bassist Bob Magnusson and drummer Jim Plank. Elario's was gone for awhile, but is now back  just not as it was. Not with that house band, anyway. 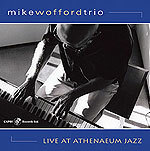 Wofford's glorious piano playing never went away, though, and a new CD shows he's playing better than ever. The former sideman for Ella Fitzgerald and Sarah Vaughan is stylistically more elastic and out there than he was at Elario's or with either of the two above legends. Not bop, not straight-ahead, Wofford's music is both and neither. Joined on "Live at Athaneum Jazz" by bassist Peter Washington and drummer Victor Lewis, Wofford finds himself in the same stratospheric talent level he was at with Mag and Plank. Surrounded by a knowledgeable and appreciative audience at La Jolla's private Athaneum music library, the trio turns out a performance that is sheer celebration of the magical possilibities of improvised music. Whether it's turning a tried-and-true standard like "My Old Flame" or "Take the A-Traine" inside out or exploring Lewis' original "Dex-Mex," Wofford and pals create some of the most imaginative, creative jazz of the past year. Hofmannn has been one of jazz' great ambassadors in San Diego. She's vainly tried to create a vibrant jazz culture in our region, opening a handful of jazz clubs and trying to make them work. None have of yet, but she soldiers on, now mostly as a performer. But, oh, what a performer! Last year, she participated with fellow flutists Frank Wess and Ali Ryerson on "First Date," an all-star date under the group name Flutology that saw her gain much deserved national attention. Her newest release, under her own name, finds her in company of her husband's wonderful trio  it is the same lineup as above with the addition of Hofmannn on flute. There are no overlaps of songs, which is a bit disappointing as it would have been very interesting and undoubtedly rewarding to hear the same song performed in trio and quartet formats. Nevertheless, Hofmann tackles much the same type of material  Billy Strayhorn and Cole Porter and Ray Brown  but brings a more straight-ahead approach to the songs than Wofford does for his. Never you mind that, though, because this trio is going to be able to handle anything you bring it, and they knock her run of standards and mainstream jazz right out of the studio. Supple, swinging and classically gorgeous, the performances on "Minor Miracle" remind what it was like to take in a show at Elario's back in the day. Less adventuresome than the Wofford album, perhaps, "Minor Miracle" is a beautiful excursion in straight-ahead jazz.